The history of "Lucky Bamboo" is a young one. 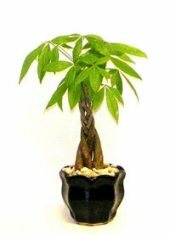 The real name is "Dracaena Sanderiana" and it is not bamboo. Ten-fifteen years ago, someone came up with the idea of curling this fast growing straight plant stalk and in a short span of time it has captured millions of people's fancy. From the tropical forests of Asia it has been transformed by innovative artists into new forms and shapes like curly bamboo, towers, pyramids, pineapples, dragons and entrepreneurs are reaping the benefits. It is certainly one of the easiest and most resilient plants on earth to care for. Today it has become a favorite for accenting homes, work places as well as gifts for various occasions. water - fire- earth - wood - metal. Enjoy my lucky bamboo guide. 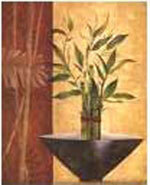 Or Lisa's imported lucky bamboo vases. Binomial name: Dracaena sanderiana Sander ex Mast. Dracaena sanderiana, known as Ribbon Dracaena, lucky bamboo or sometimes Ribbon Plant, is aspecies of Dracaena, native to Cameroon in tropical west Africa. It is one of a group of small, shrubby species with slender stems and flexible strap-shaped leaves that grow as understory plants in rainforests. It is an upright shrub growing to 1.5 m tall, with leaves 15-25 cm long and 1.5-4 cm broad at thebase. 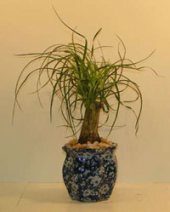 Dracaena sanderiana and related species are popular house plants. It can survive in many indoor conditions, but indirect lighting is best as direct sunlight can cause the leaves to turn yellow and burn. Although it grows better in soil, often is sold with the roots in water. The water should be completely changed every two weeks. The water should be bottled water, or soft tap water with very little fluorine. It does best in bright, indirect lighting and temperatures above 15 °C up to 25 °C. Yellow or brown leaf edges may be caused by too much direct light or fluoridated or chlorinated water, the latter of which can be prevented by leaving tap water exposed to the air for a day before plant use. Salty or softened watercan also cause this. Twisted shapes can be produced by rotating the plant with respect to gravity and directed light sources. This is difficult to achieve for most home users, but not impossible with a little time and patience. 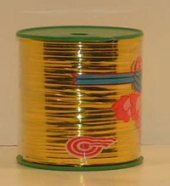 It is sometimes sold as "lucky bamboo", although it is not related to the bamboo plant. Commercial lucky bamboo will not grow taller because it has been treated to stay that height, but the leafs will keep leafing and it will grow taller. There are those who believe that new stalks can be propagated by using a sharp knife and cut through the stalk below the joint.Others do not recommend it at all. If you do make sure your knife is clean. 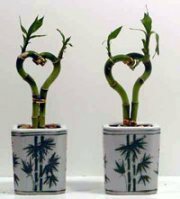 Lucky Bamboo can be potted using a soil mixture while providing lots of drainage. Suggested ratio of the container is one that does not exceed 2" of stalk group.I have seen few clients planting the stalks in theyard,in a shady area and have thrived for a few years now. This is a very easy plant to take care provided that you keep it away from the direct sunlight and you change the water once in a while. If recommendations are twice a week, I change it every month. Friends I know had the same water for a very long time . (nasty). But they survive. If filtered water is recommended, I do not and they are fine. I just add water if needed. I now use a little green liquid foodwhen I change the water. You may also add any plant food using 10% of the recommended strength. Most of the casualties I have seen was derived from forgetting to water them.I had a few batches, that had some type of white mites. We wiped the stalks with alcohol and solved the problem. This is my understanding of Feng-Shui which means wind and water. It has to do with the energy that flows through the universe, through our bodies, homes, workplace. The "Chi". It is about achieving harmony in life through clearing the space we live and work, balancing and focusing the energy that flows all around us. At work, principles are applied to better the workspace flow, like not putting another desk, and person working behind you. Not facing the window. Ways to attract costumers to stop. It's philosophy has five essential elements: water fire,wood,earth,metal. A Lucky Bamboo design withrocks, water, a candle on a metal stand become a favorite representation of these natural elements. 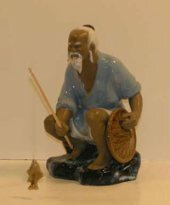 Feng Shuei bring us closer to the "universal harmony" thus achieving Happiness,Health and Prosperity. It is quite interesting knowledge even though I believe that no material objects can influence positively the atmosphere of a home as an harmonious relationship. There was a study conducted in factories whereas the working conditions were improved through better lighting, better work tables, introduction of plants. With each improvement the production increased. Then a trouble maker was introduced in the team and the production went down. With this note of caution, Feng-Shuei might not solve all your problems but certainly has much to offer. In the East, where Feng-Shui originated, the number's meaning is associated with it's own sound. 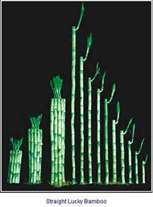 3 stalks become bearers of FU (happiness) LU (wealth) SOH Longevity). Twenty-one stalks are used as an offering for a very powerful blessing.